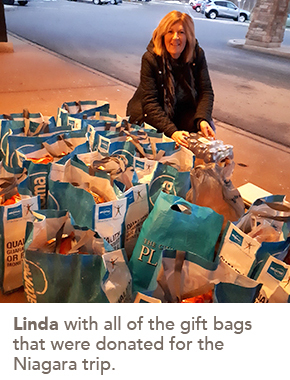 Every December, Linda Gawlik plans a bus trip to Niagara for team members at Cedarvale Lodge Retirement and Care Community and their families. She is one of the many team members across Sienna who take part in the Quality Work Life Committee, which plans events throughout the year aimed at bringing team members together. A cook in the retirement residence at Cedarvale, Linda has been with Sienna for over 20 years. She enjoys planning the trip every holiday season, packing gift bags, snacks and drinks for the trip. The Cedarvale team plays games on the bus, stops to shop, and ends their day with dinner together at a restaurant. It’s a day packed with fun and it brings the entire team closer together, a perfect example of what a Quality Work Life event should do. There are committee members at each retirement and care community at Sienna, all of them employed at the location they serve and engrained within the community’s culture. Some of the common events they host include BBQs, ice cream truck days, walk-a-thons, and group socials.